Would you like to reach every key buyer in one call? Would you like a consistent stream of qualified leads? Would you like a conversion rate of prospect to client of more than 50 percent? If you answered "yes" to any of those questions, then you're in the right place. Our guest has written two books, owned her company for 20 years, and has won multiple awards for her social media presence. When she's not working, she hikes, swims, travels the world, and spends a huge amount of time with the four most amazing grandchildren in the world. 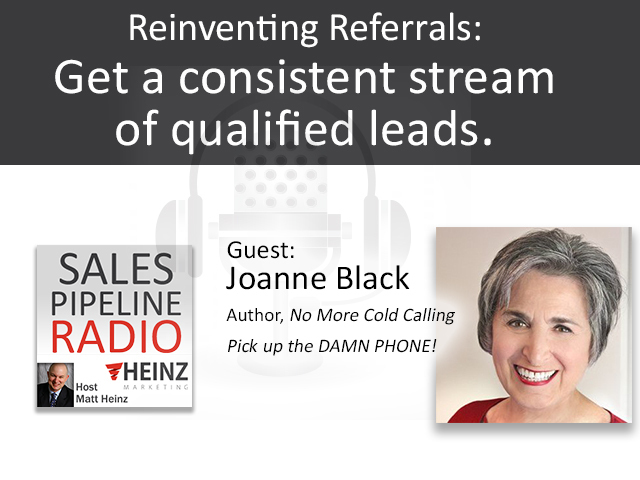 Please listen to the replay with author, speaker, and sales contrarian, Joanne Black!Or, on our blog, starting 2/1/16, listen to and/or read our incredible conversation. Take Joanne's Referral I.Q. Quiz. It’s 14 Yes/No Questions and a checklist for referral selling. Go to www.NoMoreColdCalling.com and click the link on the home page. The results are anonymous and insightful.